Subliminal Messages: Do They Really Work? Do subliminal messages really work? Great question. Everyone seems worried that advertisers can control their behavior through subliminal messages. A legitimate concern? That’s up for debate. What are some types of subliminal messages? What are real-life examples of subliminal messages? Want to learn more about subconscious influence? Download the first chapter of my book, Methods of Persuasion. Whoever came up with the definition for “subliminal” should be fired. That definition has led to some different interpretations — most of which are wrong. Hopefully this section will clear things up. Subliminal messages are stimuli that lie below our threshold of conscious awareness. Because they fall below the absolute threshold level (ATL), we can’t perceive a subliminal message, even if we’re looking for it. That’s important. Many people confuse subliminal influence with subconscious influence. But those two concepts are very different. 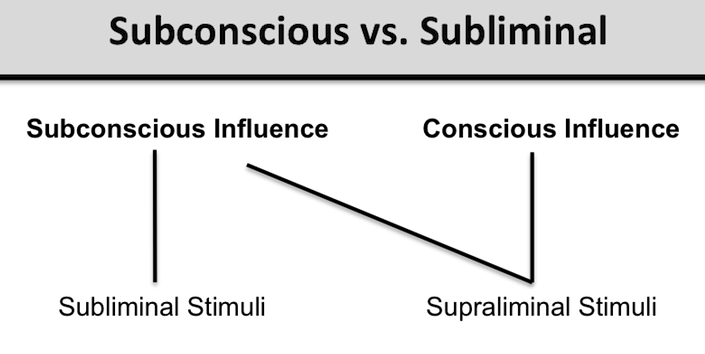 A stimulus can influence us subconsciously without being subliminal. If we can see or hear it — even if we don’t consciously notice it — it’s not subliminal. It’s considered supraliminal. Consider in-store music. When researchers played music in a liquor store, they found a startling result. On days when German music was played, German wine outsold French wine. However, the reverse happened when French music was played (North, Hargreaves, & McKendrick, 1999). Did people know that the music was influencing their behavior? Nope — they were subconsciously influenced. Did people hear the music? Indeed, they did. Thus, the music was supraliminal, not subliminal. However, subliminal factors are a different animal. We can’t consciously perceive subliminal messages, even if we’re looking for them. Needless to say, there’s a lot more skepticism toward subliminal influence. 1. Subvisual messages – visual cues that are flashed so quickly (generally a few milliseconds) that people don’t perceive them. 2. Subaudible messages – low volume audio cues that are inserted into a louder audio source, such as music. 3. Backmasking – an audio message that is recorded backwards, with the intention of playing it forward to disguise the reversed message. People claim that subliminal messages have shown up in advertising, movies, and music. It’s a fascinating concept, no question. Unfortunately, most of the examples are purely coincidental. People will see meaning in anything if they’re looking hard enough. Not to mention, a lot of the popular examples aren’t even “subliminal” at all. The cues are just supraliminal stimuli disguised within a visual. Nevertheless, here are a few examples — subliminal and supraliminal — that have become popular. You can blame the subliminal advertising chaos on James Vicary. In the 1950s, Vicary claimed to boost concession sales at a movie theater by flashing “Eat Popcorn” and “Drink Coke” during a movie. Long story short: his claim was a hoax. Despite Vicary’s confession, the damage was done. People became scared that mind control was possible, and the hoax gave advertising a bad rap. Notice the dollar bill in the lettuce? A pretty coincidental placement of the “s”…dontcha think? Advertisers aren’t the only people getting criticized. Movie editors from Disney — yes, Disney — have been criticized for putting subliminal messages in movies. Here are a few examples. One famous example of subliminal messages in music can be found in Judas Priest. In 1990, the band was accused of putting backward messages of “do it” in a song. And those messages allegedly caused the suicide of two male teenagers. The judge found no evidence, and the band was cleared of the charges. If you’re familiar with my background, then you’ll know that I used to perform as a stage “mind reader.” In my mind reading show, I claimed to use subliminal messages to accomplish some of my routines. But here’s the truth: I never used any subliminal messages in my show. In fact, I was ( and still am) very skeptical about the influence of subliminal cues. In my live shows, I always gave a disclaimer that my routines were based on magic and sleight of hand, rather than psychology. And my routines involving “subliminal messages”? Well, they’re based entirely on trickery and plain ol’ BS. Does that mean subliminal messages don’t work? A few decades ago, researchers would have agreed that subliminal messages were BS. They found little, if any, support that they were effective (Vokey & Read, 1985). In recent decades, however, the outlook has been slightly changing. Emerging research has shown that subliminal messages can influence our thoughts and behavior (see Kunst-Wilson & Zajonc, 1980 for one of the first notable studies). For instance, new research has shown that subliminal messages in advertising can, in fact, influence our purchasing behavior. For example, participants in one study were significantly more likely to choose a Lipton Ice drink when they were subliminally primed with “Lipton Ice” (Karremans, Stroebe, & Claus, 2006). Pretty cool. Fitzsimons, Chartrand, and Fitzsimons (2008) found that people were able to list significantly more uses for a brick when they were subliminally primed with the logo from Apple (compared to IBM’s logo). Why? The subliminal exposure to Apple’s logo temporarily enhanced people’s creativity. Murphy and Zajonc (1993) found that people developed a more favorable opinion of ambiguous symbols after they were subliminally flashed with smiling individuals. In fact, this effect was stronger when the exposure was subliminal. Bornstein, Leone, and Galley (1987) found that people agreed more with a person after they were subliminally flashed with a picture of him or her. Légal, Chappé, Coiffard, and Villard-Forest (2011) subliminally primed people with the words “to trust.” The result? Those people found a message about tap water consumption to be significantly more persuasive. For subliminal messages to influence behavior, people must already want to do that behavior. For example, researchers found that subliminal messages relating to thirst were only effective toward participants who were already thirsty (Strahan, Spencer and Zanna, 2002). For people who weren’t thirsty, the subliminal messages made no difference. The takeaway? Subliminal messages can’t control your behavior. They can only guide your decision (e.g., choosing Lipton Ice versus some other beverage). In addition to advertising, another common area of debate involves self-help audios. There are a whole slew of subliminal audio programs that are supposed to help people lose weight, stop smoking, improve their memory, and the list goes on. Do they work? Research shows that subliminal messages in self-help tapes are effective. BUT…they’re effective because of the placebo effect (Greenwald, Spangenberg Pratkanis, & Eskanazi 1991). The subliminal cues, themselves, are essentially useless. Subliminal messages have garnered a lot of skepticism (and rightly so). Nonetheless, emerging research has given this field a new outlook. While some aspects have been debunked (e.g., subliminal self-help tapes), researchers have been finding merit to other aspects (e.g., subliminal priming). Can subliminal messages influence your thoughts and behavior? Yes, they can. However, subliminal messages can’t make you do something you wouldn’t want to do. So everyone can finally put their fear to rest. Bar, M., & Biederman, I. (1998). Subliminal visual priming. Psychological Science, 9(6), 464-468. Bornstein, R. F., Leone, D. R., & Galley, D. J. (1987). The generalizability of subliminal mere exposure effects: Influence of stimuli perceived without awareness on social behavior. Journal of Personality and Social Psychology, 53(6), 1070. Dehaene, S., Changeux, J. P., Naccache, L., Sackur, J., & Sergent, C. (2006). Conscious, preconscious, and subliminal processing: A testable taxonomy. Trends in Cognitive Sciences, 10(5), 204-211. Dijksterhuis, A. (2004). I like myself but I don’t know why: Enhancing implicit self-esteem by subliminal evaluative conditioning. Journal of Personality and Social Psychology, 86(2), 345. Eimer, M., & Schlaghecken, F. (2003). Response facilitation and inhibition in subliminal priming. Biological Psychology, 64(1), 7-26. Gläscher, J., & Adolphs, R. (2003). Processing of the arousal of subliminal and supraliminal emotional stimuli by the human amygdala. The Journal of Neuroscience, 23(32), 10274-10282. Greenwald, A. G., Klinger, M. R., & Schuh, E. S. (1995). Activation by marginally perceptible (” subliminal”) stimuli: Dissociation of unconscious from conscious cognition. Journal of Experimental Psychology, 124(1), 22. Karremans, J. C., Stroebe, W., & Claus, J. (2006). Beyond Vicary’s fantasies: The impact of subliminal priming and brand choice. Journal of Experimental Social Psychology, 42(6), 792-798. Krosnick, J. A., Betz, A. L., Jussim, L. J., Lynn, A. R., & Stephens, L. (1992). Subliminal conditioning of attitudes. Personality and Social Psychology Bulletin, 18(2), 152-162. Mogg, K., Bradley, B. P., Williams, R., & Mathews, A. (1993). Subliminal processing of emotional information in anxiety and depression. Journal of Abnormal Psychology, 102(2), 304. Monahan, J. L., Murphy, S. T., & Zajonc, R. B. (2000). Subliminal mere exposure: Specific, general, and diffuse effects. Psychological Science, 11(6), 462-466. Murphy, S. T., & Zajonc, R. B. (1993). Affect, cognition, and awareness: Affective priming with optimal and suboptimal stimulus exposures. Journal of Personality and Social Psychology, 64(5), 723. Pessiglione, M., Schmidt, L., Draganski, B., Kalisch, R., Lau, H., Dolan, R. J., & Frith, C. D. (2007). How the brain translates money into force: A neuroimaging study of subliminal motivation. Science, 316(5826), 904-906. Seitz, A. R., & Watanabe, T. (2003). Psychophysics: Is subliminal learning really passive?. Nature, 422(6927), 36-36. Stapel, D. A., & Blanton, H. (2004). From seeing to being: Subliminal social comparisons affect implicit and explicit self-evaluations. Journal of Personality and Social Psychology, 87(4), 468. Strahan, E. J., Spencer, S. J., & Zanna, M. P. (2002). Subliminal priming and persuasion: Striking while the iron is hot. Journal of Experimental Social Psychology, 38(6), 556-568. Vokey, J. R., & Read, J. D. (1985). Subliminal messages: Between the devil and the media. American Psychologist, 40(11), 1231. Winkielman, P., & Zajonc & Norbert Schwarz, R. B. (1997). Subliminal affective priming resists attributional interventions. Cognition & Emotion, 11(4), 433-465. Zajonc, R. B. (2001). Mere exposure: A gateway to the subliminal. Current Directions in Psychological Science, 10(6), 224-228. So, you want to stay updated? Awesome. Every few weeks, I’ll send you interesting and clever ideas based on my research in psychology. You got it. I'll send you the PDF. You’ll also get access to a page with ALL of my PDFs and bonus content.